The creation of the Federal Republic of Germany this week presents Europe with another political enigma. The fateful question being asked today is: "What kind of a government will the new German state turn out to be?" The other day in Bonn, the man who most likely will head the new republic, Dr. Konrad Adenauer, gave CBS News an exclusive interview. The 73-year-old Rhineland politician outlined to me the goals toward which he hopes to lead the German democracy as the nation's first chancellor since Adolf Hitler. The recent German elections, and the resultant right wing victory, according to Adenauer marks a distinct change in the thinking and attitude of the people. "It is a great shift in public opinion," he says. "Since the end of the war the attitude of the German people has been 'let the government or the occupation powers solve our problems.' But in the past year, with the currency reform and the boom in German industry, the individual is beginning to set out to solve his own problems." It is this spirit within the people that moved the vote away from the left; away from the Socialists and Communists, Adenauer declared. Thus, he maintains, his government has the mandate to continue the free economic policies instituted by the American military government in Frankfurt. "Individual enterprise must be given a chance to continue its upward climb which already has achieved so much in Germany." I asked Dr. Adenauer about the threat of nationalism in Germany, a threat that incidentally comes from the right. The chancellor-to-be said he had heard of the outside criticism which arose during the campaign. "But," he said, "these reports of growing German nationalism are exaggerated. They were started by people whose motives are questionable" . . . by which he meant his political opponents in the Socialist Party. Then, in the strongest statement on the subject thus far, Adenauer declared: "We are conscious of the threat. Any government that I head will be alert for signs of the wrong kind of German nationalism . . . and will beat it down." I asked Adenauer what would be the foreign policy of the Federal Republic. He protested that he could not go into detail on this subject, since the occupation powers have reserved the right to dictate in this field. "Germany must incorporate her hopes and goals with the Western world." Earlier Adenauer had advocated that the republic join the Council of Europe, which just completed its meeting in Strasbourg. Then the German political leader said a strange thing. "America," he stated, "won the war by entering into it. But I think that history will remember the United States far more for her participation in the postwar world than her victories on the battlefield. Never before in history has a victor set out to deliberately rebuild the vanquished. This fact alone gives great hope for the future," Dr. Adenauer concluded. "This is implementing the Christian principle of 'love thy neighbor' . . . a principle which can be the basis for a peaceful and prosperous world." A few hours from now the parliament of the Federal Republic of Germany will elect a president—the first president Germany has had since the death of Field Marshal von Hindenburg fifteen years ago, whereafter Hitler abolished the job. "I swear that I shall dedicate my strength to the well-being of the German people, enhance what is to its advantage, ward off what might harm it, uphold and defend the Basic Law and the laws of the Federation, fulfill my duties conscientiously, and do justice to every man. So help me God." The man most likely to take this oath and become the titular head of this new state is Professor Theodore Heuss of Stuttgart—65, white-haired, dignified leader of the Free Democratic Party. Heuss heads the party which is one of the mainstays of the right wing coalition government that must be formed by Dr. Konrad Adenauer, the man expected to become chancellor. A student of art and economics, the professor is the author of several books, including one called "Hitler's Way," which was publicly burned by the Nazis. For seven years he served as a member of the German Democratic Party in the old Reichstag. The only blot on his record is that he voted for the enabling of the law in 1933 that allowed Hitler to become dictator of Germany. Heuss also made some political deals with some strange neo-Nazi cats in strengthening his Free Democratic Party in the last campaign. The president's job is mostly an honorary one, since the real law and policy making are done under the direction of the chancellor. But as a symbol of Germany, Professor Heuss—if he is elected this afternoon—will be that of a conservative, German intellectual. His party platform boasts that it stands without reservation for a capitalist economy, being the "bitterest foe of Socialism and planned economy, for both mean nothing less than the realization of monopoly dictatorship." Heuss will not be elected unanimously. The opposition Socialist Party is reported to be preparing a candidate to run against him, although the Socialist nominee is not expected to get the required majority. I talked with the aging professor the other day. He told me his prime interest in the presidency is to again raise Germany to a position of respect and honor among democratic nations. This is Bill Downs in Bonn. Now back to CBS in New York. A lot of old Rhine wine and older platitudes are flowing in Bonn today as occupation and government officials formalize the election of Germany's new president. At an official reception this morning, the American, British, and French high command met to congratulate Professor Theodore Heuss on his election to the presidency. The French high commissioner, M. François-Poncet, spoke for all three occupation governments, saying that Germany is now taking a new shape, and that the Western powers would cooperate to do their best for the new Germany. "It is the hope of the occupation powers that Germany will find a way back to the family of democratic and peace-loving nations of the world." In his reply as president, the lanky white-haired professor concurred in this goal and said his government was prepared to give up part of its powers in order to return to what he called "the European community." With some significance, Heuss added that the government is not forgetting the people of Berlin and of Eastern Germany who are not yet able to join the republic. Behind all these high-flown words, however, the politicians here resemble starving men in a bakery as they struggle for a cut of the political pie set before them by the creation of the new government. Within the next few days—possibly today—Heuss will appoint Dr. Konrad Adenauer as chancellor and ask him to form a cabinet. The right wing coalition gained a tenuous majority yesterday in the vote for the presidency, but there are enough uncertain votes that can spell trouble for the Adenauer government—unless, of course, he is able to pacify them by handing out political patronage and positions to the doubtful parties. The German Communist Party here finally broke its silence which it has maintained since its poor showing in the general elections. The Communists voted yesterday straight down the line with their archenemies, the Socialists. They explain today that this was done not because they liked the Socialists, but because they wanted a working class vote to be registered. The Communists would like to make a political marriage of convenience with the large Socialist Party which carries the main burden of the opposition to the government. However, the Socialists are having none of it. Dr. Konrad Adenauer, head of the Christian Democratic Party, is the new Chancellor of the Federal Republic of Germany, becoming the parliamentary strongman of the new state under what appears to be a very shaky coalition of right wing parties. Adenauer was confirmed as chancellor at Bonn this morning by a one-vote majority. He got 202 out of 402 votes. His opposition cast 142 votes against him, and there were 44 abstentions. The closeness of the votes means that the 73-year-old government leader is going to have to continue to play his legislative cards with extreme care if he is to guide any sort of program through the parliament. The new legislature now has dispensed with the opening formalities and is getting down to work. There was a marked absence of morning coats and wing collars at this morning's session. The coalition cabinet is expected to be announced tomorrow. The Soviet-licensed press of East Germany has been making vitriolic attacks on the Bonn government, but I am informed that the real interest of the Communists lies not in Bonn, but in Budapest and the trial beginning Friday of László Rajk, the former Hungarian foreign minister now charged with treasonous Titoism. My informants say that within the next few weeks a Yugoslav exile government aimed at ousting the Marshal Tito will be established in Bucharest, Romania. Already a new powerful radio transmitter called the vote of "revolutionary Yugoslav emigrants" is operating. The ultimate aim, I am told, is to promote a civil war in Yugoslavia under the direction of the Cominform, but that so far there are no plans for direct intervention by the Soviet Union in this war; that Russia does not choose to risk a larger conflict by using her own troops officially in Yugoslavia. This intelligence, if correct, would serve to remove a large part of the threat of another world war emanating out of the Balkans—for the time being, at least. Die Bundesrepublik Deutschland—the Federal Republic of Germany—held its first parliamentary meeting two hours ago, thus marking September 7, 1949 a significant day in German history and one which the world will note as the second time in thirty years that this nation has sought government through democracy. The upper house of the republic met this morning. The main body, the Bundestag, meets this afternoon. Both meetings are ceremonial and preliminary to the real work, which will begin next week. These initial meetings today represent a victory by more than one thousand workmen who until dawn this morning were still sweeping construction materials from the aisles and the streets in front of the new provincial capital building. High Commissioner John McCloy attended the opening session with his staff all dressed up in black coats and and striped trousers. Representing the United States occupation forces was General Thomas Handy, new military commander for Germany. The British and French high commissioners also are here. The color motif of the ceremony was the red, black, and gold of the German national banner, and surrounding it were the flags of the eleven states. 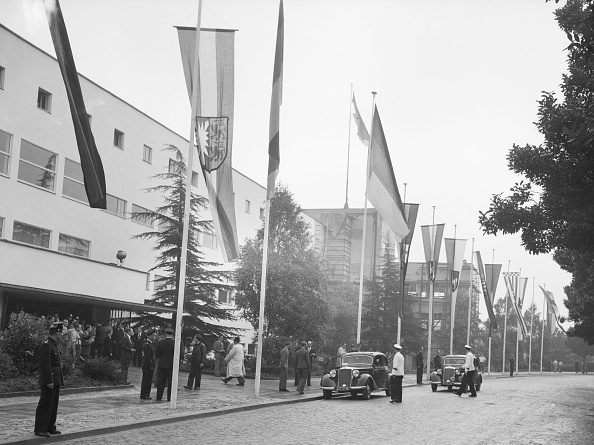 Significantly included in this lineup of banners was the flag of Berlin, for although Berlin is not officially a member of the new government, it has eight observers here who hope to persuade the republic to accept the city as a full-fledged state. Dr. Karl Arnold, Minister President of the Ruhr state of North Rhine-Westphalia, was elected chairman of the upper house. He made a brief, formal speech pledging the government to be a servant of the people, but otherwise he said nothing of significance. On the whole, the first meeting was conducted with great dignity, from the purple robes of the two Catholic bishops attending, to the top hats, wing collars, spats, and striped pants and morning coats worn by many of the delegates. The proceedings began and ended with music from the Haffner Serenade by Mozart. Incidentally, this is the first trans-Atlantic transmission from the studios of the capital of the German Federal Republic. We will be reporting further from here. The news from the new German capital will play an increasingly important part in the pattern of the future. We hope that this news from Germany will be part of a pattern for peace. 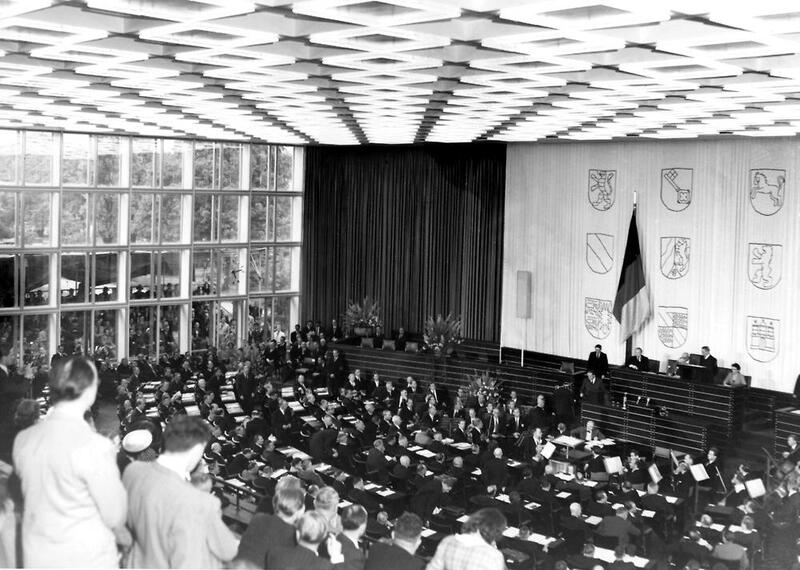 Tonight the world has a new government on its hands in Bonn, the provisional capital of Die Bundesrepublik Deutschland—the Federal German Republic. And today we saw the new German parliament formally take a tentative grip on the system of government called democracy. The upper house of the parliament met this morning, and the lower house completed its first meeting only a few hours ago. All in all, it was a dignified performance. Whether it will grow into a truly democratic and free government has yet to be proved. But the democratic processes are fermenting. At this morning's meeting of the upper house, there occurred an old-fashioned political double-cross. The body, controlled by the Christian Democratic party coalition, elected Dr. Karl Arnold of the Ruhr as its chairman. For weeks the CDU and others had hinted that the job would go to Dr. Hans Ehard, leader of the Bavarian wing of the party. The Bavarians are mad—not an uncommon occurrence among democratic politicians. But this afternoon, at the meeting of the German house of representatives, came the most positive demonstration that the Germans are tired of saying "ja," which they did so monotonously under Hitler. Elder statesman Paul Löbe gave the opening speech. He drew applause when he said that Berlin, his hometown, must eventually be the capital of a united Germany. He reviewed the sad events leading up to the Nazi dictatorship, calling it "the illegal government that took over in 1933." At this point Max Reimann, the leader of the Communist delegation, interrupted with a shout: "Yes, and how many persons in this room made it possible for Hitler to come to power in 1933?" The question went unanswered. At another point in Löbe's speech, the Christian Democratic members objected to the emphasis that the speaker was putting on his own party, the Socialists. Hundreds of people stood in the rain today to watch the show; to see their delegates, the American, British, and French high commissioners, and other dignitaries. Throughout the rain the black, red, and gold flag of the German republic bore its colors bravely. Germans tell a cynical story about this flag. The gold, they say, stands for the past. The red stands for the present . . . and the future is black. But there was nothing in the first day's operation of the parliament to justify this cynicism. As a matter of fact, and with the usual reservations, it was a pretty good show. This is Bill Downs in Bonn. Now back to Ed Murrow in New York. The East German Communists have declared a propaganda war on the West German Republic of Bonn, and this morning all the standard old vilifications are being dragged out again to attack the political leaders now attempting to shape the destiny of the new state. Initial reaction from the Soviet zone came today in headlines like this: "Germans, Wipe Out the Shame of Bonn. Another paper claims that "protestors come from all zones against the betrayal of the nation." West German political leaders are called "splitters and quislings." Communist leader Wilhelm Pieck said in a broadcast last night that the Bonn government is not a German government. "The parliamentary farce staged in Bonn last Wednesday is nothing but a wholesale swindle," he declared. Behind all these cries of "wolf" in the Russian zone, the Communists are doing some frantic political scrambling on their own. I learned that leaders of the Soviet-licensed political parties last weekend met with Ambassador Semyonov concerning elections in East Germany to establish a Russian-sponsored state. According to one Russian political adviser: "Russia regrets that the Western powers have taken the initiative for the political reorganization of the German state," he said. The Soviet Union was hesitant about being the first to bring about the complete division of the country. According to my information, this official said that Moscow now has sent concrete instructions for the foundation of an East German government, with orders for the Soviet military administration to carry them out. In Bonn itself, Dr. Konrad Adenauer is trying to solve a crisis in his own Christian Democratic party. The Bavarian wing of the party is threatening to revolt over the failure to get their man, Dr. Hans Ehard, elected as president of the senate. In Munich, funeral preparations are underway for composer Richard Strauss, who died yesterday at the age of 85. Before his death, Strauss requested that no flowers be sent to his funeral—that instead contributions be made to a fund for aging musicians. Also in Bavaria, German authorities have arrested Hermann Esser, the fugitive former Bavarian economics minister there under Hitler. Esser was picked up when he contacted a local publisher about printing a book he had just completed. The name of the book was to be: "Adolf Hitler, the Great Lover." There was a classic precedent. When Abraham Lincoln's secretary John Hay told him some people wanted Gen. U. S. Grant removed because he drank, the President tossed off a characteristic retort: "If I knew what brand of whisky he drinks, I would send a barrel or so to some other generals." It turned out last week that Gen. Dwight D. Eisenhower had followed essentially the same reasoning in dealing with one of the greatest personal scandals of United States Army history—the case of Gen. George S. Patton and the two "shell-shocked" privates. Because Patton, like old Grant, is a fighter, Eisenhower had let Old Blood and Guts off lightly—with a reprimand that "took his hide off" and an order for him to apologize to all concerned. But the affair was too spectacular and too shocking to be left at that. In the Senate—which happened to be considering a promotion for Patton—it was slated this week to be fully discussed on the floor. The Man: From the beginning no one doubted Patton was capable of manhandling his soldiers. Once the story was out, correspondents in North Africa rehashed over all the incidents that added up to the character of an extraordinarily tough, flamboyant, and emotional soldier. Even in battle he insisted on strict compliance with regulations on dress—woolens even in the desert; helmets and neckties, too, at all times. "Put on your leggings," he barked to a captain during the fierce fighting at Guettar. 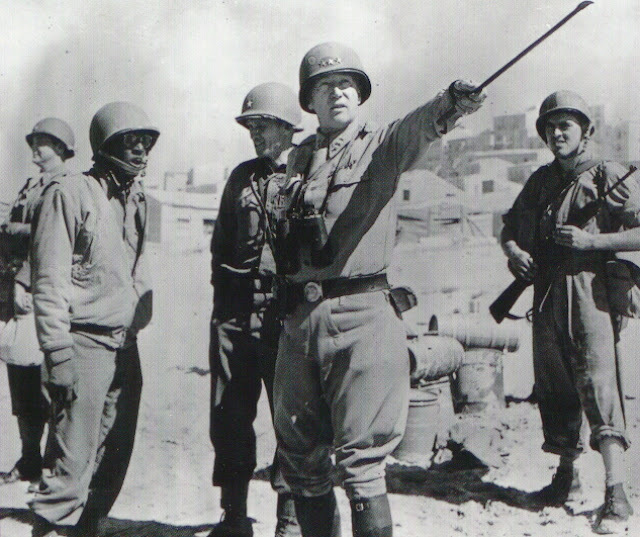 In the thick of the Sicily campaign and not far from the front, Patton was touring hospital tents near San Stefano. He went the rounds commending wounded soldiers. Then he came upon one who sat on the edge of his cot. "Where were you wounded?" asked Patton. The soldier, a "shell-shock" case,* mumbled something about hearing shells that never landed and guessed it was his nerves. Well known for his disbelief in the reality of "shell-shock," Patton flew into a rage, called the soldier "yellow-bellied," and gave him a backhanded cuff that knocked off the man's helmet lining. A nurse lunged at the general but was restrained and led away weeping. As he was leaving, Patton heard the soldier sobbing. He strolled back and slapped the private again. At about the same time, Patton similarly upbraided another "shell-shock" victim. Hearing from a doctor and newspapermen about Patton's "unseemly and indefensible" behavior, Eisenhower told Blood and Guts that a repetition would bring his instant removal and ordered him to apologize to all concerned. He sent a general to Sicily to investigate and went there himself. Patton did apologize, not only to the private, the nurse, and the doctors, but to all divisional officers he could find. Inquiry into troop morale convinced Eisenhower that "no great harm had been done." 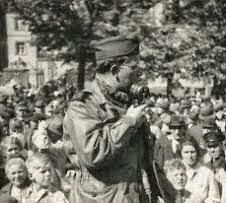 He noted that whenever Patton recently addressed his troops he got "thunderous applause." The Law: Under the Articles of War, Patton could have been court-martialed for assault, dismissed for conduct unbecoming of an officer, or merely admonished. As theater commanding officer, Eisenhower chose admonition—because Patton is "an invaluable officer who has done great things and can do more." Few last week questioned Eisenhower's choice. As Stimson put it, the Army selects its theater commanders carefully, gives them full authority, and holds them responsible for their decisions. Hence Eisenhower's decision would boomerang first upon Eisenhower, if anyone. The Reaction: Eisenhower's report failed to satisfy all of Congress's questions. Weeks before President Roosevelt had sent the Senate a batch of Army promotions—one raising Patton from his permanent rank of colonel to major general, two grades higher; another elevating General Smith from lieutenant colonel to brigadier general. All had been held up until both houses had passed a bill to eliminate a long-standing requirement that before promotion lieutenant colonels must have served 28 years in the Army (Smith had spent only 26). All were finally ready for confirmation when the Patton revelations once more stalled action. The best way out, decided the Senate Military Affairs Committee, was to let Eisenhower's report simmer and then bring it to the floor this week. Meanwhile, as appears inevitable in irreverent America, the Patton incident became the subject of gags. Junior officers and civilians around the Pentagon proposed a new decoration—the Order of the Boot—for victims of "Pistol Packin' Patton." * A misnomer. Now called "battle anxiety" or "exhaustion," the condition results from fatigue, noise, and protracted strain. Treatment consists of sleep, special diets, and warm baths and usually refits men for combat in a matter of days. A report has come into my hands this morning of a confidential meeting of East Berlin editors and newsmen working on Russian-licensed newspapers. The meeting was called yesterday to give guidance to the people who publish the pro-Communist newspapers as to the current Kremlin policy on Germany. It provides an interesting insight to the workings of the Communists in the current East-West struggle for the country. The main speaker at the meeting was Rudolf Herrnstadt, editor-in-chief of the Communist paper Neueus Deutschland. Herrnstadt told the East zone newsmen that the Soviet military government is not interested at the present time in increasing political tension in Berlin—to take it easy for the time being. Herrnstadt also said that Russian policy is to avoid any situation that might precipitate a war—that the first objective of the USSR today is to rebuild her own territories destroyed in the last war. At the present time, he said Soviet scientists are intensifying their work to overtake discoveries of the Capitalist countries—presumably a reference to the atomic bomb. According to the Communist editor, the Russian technicians already have developed an air force that can match anything in the world. At this point, Herrnstadt had to insert some propaganda. The reason the Russian air force is so good, he said, is not only its technical superiority, but also the fact that Soviet fliers are all heroes. Russian airmen, he concluded, will win through because they fight with patriotism in their hearts, whereas American airmen, like those flying the airlift, think only of the high salaries they make. The struggle between East and West in the four-power city of Berlin has resolved itself into a "weekend war of words." Western sector newspapers this morning warn Berliners in the non-Communist part of the city not to take West Marks or Western publications into the Russian section of town today. They claim to have been tipped off that the Communist People's Police are planning a series of arrests, searches, and raids in an attempt to stamp out the distribution of pamphlets and the painting of signs on buildings which have been embarrassing to the Soviet-sponsored regime of East Berlin. In the Russian headquarters town of Potsdam just west of Berlin, police discovered a suitcase left in a railway station which contained 380 pamphlets headlined "Is Tito a Traitor?" The undercover anti-Communist propaganda campaign in East Berlin is not considered by authorities here to be of any great moment. There is most activity during the weekends because this is the time that Berliners cross sector boundaries to get to lakes and resorts and visit friends and relatives. So far none of the big painted "F's"—standing for freedom—have been found in the American, British, or French sectors—only in the Russian. Reports continue to come in that Russian authorities are organizing German units to send to the Yugoslav-Hungarian border for possible action against the recalcitrant Tito. At the Helmstedt zonal crossing point in the British zone, twenty young Germans between the ages of eighteen and twenty-one are said to have deserted the Communist-led police for fear of being shipped to Yugoslavia. A major test of German intentions and responsibility is in the making in Bavaria today. The military government licensing system for newspapers has been replaced by the German press law, and now an American official reveals that a wealthy group of former Nazis backed by huge capital are setting out to gain control of the German press by driving the Western-licensed newspapers out of business. 106 new newspapers are expected to start within the next few weeks in Bavaria alone, which according to the official will revive "chauvinism, rabble-rousing, antisemitism, and anti-Americanism." Two Communist-controlled Berlin newspapers, Tägliche Rundschau and the Berliner Zeitung, demand in front page editorials that all foreign occupation troops withdraw from Germany. This appears to be a new and important propaganda line from Moscow, and it may be the first indication of a significant change in Russian foreign policy. Tägliche Rundschau, the most virulent of the Russian-licensed publications attacking America, headlined the story of the withdrawal of Soviet troops from Korea, and in an accompanying editorial teed off on American occupation policy, saying that the Red Army came as a liberator for the German people while the United States troops came merely as instruments of colonial oppression. Other East zone newspapers followed suit. The Communist propaganda line has long been attacking American foreign policy as being a twentieth century version of British imperialism, but this is the first time that their argument has been used to demand total withdrawal of troops from occupied Germany. Diplomats here in Berlin this morning are waiting to see whether the new Communist propaganda line is more than a trial balloon or just another bid for the good will of the Germans. 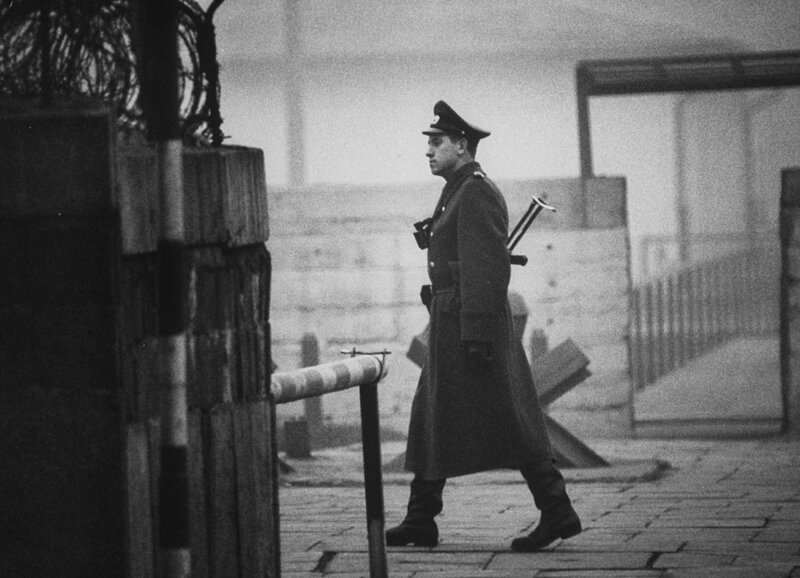 Some see the surprise withdrawal from Korea and the demand for withdrawal from Germany as further evidence of Russian isolationism—of further evidence of Soviet fear of war. Thus, by proposing withdrawal of troops at the only two spots where the East and the West have common military borders, the likelihood of incidents will be reduced, and the struggle between Communism and Democracy can be pursued politically without the presence of arms. This demand, coming as it does on the opening of the United Nations, is most certainly the most interesting diplomatic development in many months. You remember that, at the Warsaw meeting of the Cominform—the new organization of world Communism—a resolution was adopted demanding complete withdrawal of troops from occupied territories. Now, perhaps, that resolution is being implemented. In any event, and whatever meaning this new propaganda line might have, it does appear that the Communists in Europe prefer to fight their battle at this moment with words rather than bullets. The first snow of the critical winter now approaching fell in the Harz mountains last night—an event of great importance for Germans. However, this first snowfall, for all of its chilly significance, isn't receiving much attention here in Berlin. The people, the press, and most of all, we who are here as conquerors, look to Paris and the United Nations for the next move in the international struggle in which the world finds itself. I must admit that I have found very little here that gives much hope for the future. One of the things you absorb when coming to this country is a peculiar cynicism. The Germans have found it after years of dealing with the Nazis. The Russians foster it through their contradictory propaganda. And the Americans, British, and French contract this cynicism through just living in its atmosphere. For what it's worth, the Communist-controlled newspapers are saying that if the Berlin and German problem is placed before the United Nations it will only make matters worse. The Russian-licensed newspapers here maintain that the German question is not one for the UN but for the foreign ministers. About the only ray of hope in this Communist-sponsored comment is that they point out that the Moscow talks have not ended but have only been recessed. But the cynicism I spoke of is best expressed by the British-licensed newspaper the Social Democrat. It says that the fact the Deputy Foreign Minister Vyshinsky is representing the Soviet Union instead of Molotov is proof that the Russians will oppose bringing the Berlin blockade before the UN. The paper says that the UN is doomed to failure because of the single fact that there can never be negotiation and agreement between totalitarianism and Democracy. And finally the Social Democrat editorial observes: "What can happen in Paris, then? Well, if no miracle occurs...nothing." But perhaps the best illustration of the 1948 brand of German cynicism is in the caption of a cartoon which appeared last week. One German asks another: "Who's going to win the third world war?" The other German replies: "Who knows? They haven't even decided on who won the second." Since the crisis in Italy overshadows all other news, Newsweek this week devotes the entire abroad department to the Fall of the Duce. At 11 o'clock on the night of July 25, 1943, the last stage of the second world war began for Italy. At exactly that hour Benito Mussolini had been relieved of his post as Premier. Wracked by Allied bombing, invaded by an overwhelmingly superior Anglo-American army, and refused large-scale aid by the Germans, Italy faced the most terrible problem in its history—how to end the struggle with the Allies without at the same time provoking violent retribution from its erstwhile Nazi Allies. The life of the Italian nation hung in the balance. Proclamation: The fall of the Duce was made public in three proclamations. The first was by King Victor Emmanuel. That wizened and deflated little monarch announced that he had accepted the "resignation" of Mussolini and appointed as Premier Marshal Pietro Badoglio, former Chief of Staff and Italy's most respected soldier. The second proclamation was also issued by the King. In it he assumed personal command of all the armed forces, called on each Italian to "take up again his post of duty and of fighting," and expressed confidence that Italy would "find again a way of recovery." The third came from Marshal Badoglio, who proclaimed that he was taking over complete power and that "the war continues." After these announcements the Royal March was played. But for the first time in 21 years the Fascist anthem, "Giovinezza," was omitted. The next act in the drama was another proclamation ordering martial law throughout Italy, imposing a dusk-to-dawn curfew, barring all meetings of more than three persons, and establishing other stringent security regulations. Telephones and communications with other capitals were cut off. A few dispatches filtering into Switzerland told of an angry crowd attacking German anti-aircraft gun crews in Milan. On the Swiss border black-shirted Fascist militia guards were replaced with Carabinieri. Late Monday Badoglio announced the formation of a new Cabinet. There was no authentic news of the Duce. The swiftly unfolding crisis in Rome echoed in every capital throughout the world. Berlin at first maintained a strained silence. Then radio announcers went on the air with ambiguous explanations that explained nothing. And they referred to the poor state of Mussolini's health. In Spain the Cabinet was called into emergency session. Throughout France thousands defied police and listened to Allied radio stations. In Washington the news seemed almost too good to be true, and Secretary of State Cordell Hull told reporters that the unconditional-surrender policy still stood. How other Allied centers received the news was told in cables from Newsweek's correspondents. The London bureau wirelessed: "The strongest note apparent in informed circles is one of extreme caution. But the oft-quoted man-in-the-street has greeted the news with the greatest jubilation and the general belief that Italy is already virtually out of the war." Bill Downs, Newsweek and CBS correspondent, sent this message from Moscow: "Russians first heard the news of Mussolini's resignation at 6 a.m. Monday morning when the radio gave it the preferred position just after the reading of the Soviet communiqué. The Russians are not people who dance in the streets, but there'll be many factory meetings for discussion and interpretation in the next few days. At these meetings the general satisfaction about this first complete victory over dictatorship will be expressed." From Algiers, Merrill Mueller, Newsweek and NBC correspondent, wirelessed: "Mussolini's resignation can only be construed as a great blow against the Axis, designed materially to shorten the war. Allied propaganda insisted that the Italians throw out the Fascists and set up a government with which the Allies could deal. It begins to appear that they've done exactly that. The events leading up to the Duce's downfall had been in the making ever since that June day three years ago when he took an unprepared Italy into the war. But the immediate sequence of events that brought about his downfall came with the speed of modern war. After the collapse of Axis resistance in North Africa in May it was obvious that political developments of great importance were in the making in Rome. To a people as realistic as the Italians the fate in store for Italy was perfectly evident. The exact interplay of political forces at the time was clouded, but the strange result was the emergence of the most radical wing of the Fascist party in an apparent dominant position. Then came the invasion of Sicily. The tone of the Italian press and public spokesmen changed. Their defiance of the Allies had a hollow ring. Their protests against insufficient aid from the Germans had the sound of heartfelt truth. The fateful day of crisis most likely occurred during the conference last week between Mussolini and Hitler somewhere in Northern Italy. The Führer came on the Duce's urgent summons, and the communiqué issued after the meeting was as cold as the monocle of the German officer who probably drafted it. What happened at the meeting was the direct prelude to Mussolini's downfall. According to most versions, the Duce had asked the Führer for large-scale aid—some twenty divisions—to hold Italy. Hitler replied with a proposal that instead the Italians abandon Sicily and fight a rearguard action up most of the Peninsula, finally establishing a line north of Rome with German aid. When the Duce was forced to present this scheme to the King and the army, the game was up. Significance: What happened in Italy was a political event comparable in importance to the fall of France, only this time it was the Allies and not the Germans who were the gainers. It was something that doesn't happen unless a nation is in the first stages of dissolution, because in himself the Duce was as much the government of Italy as the parliamentary regime was the government of France. The King's words that Italy would "find again a war of recovery" almost certainly meant that Fascism was to be liquidated as a system of government. Likewise Badoglio's first actions were in conformity with his record of opposition to Fascism. Thus the political structure of Italy had in effect been destroyed. That did not mean that the new government was committed to an immediate peace. Its first concern probably was to arrive at some arrangement with Germany. The 1939 military alliance is still in effect despite the change of regime. Furthermore, the Italian Government does not have the power to force the German units on Sicily, for example, to lay down their arms. In the Balkans also there are about fifteen German and fifteen Italian divisions under mixed command. 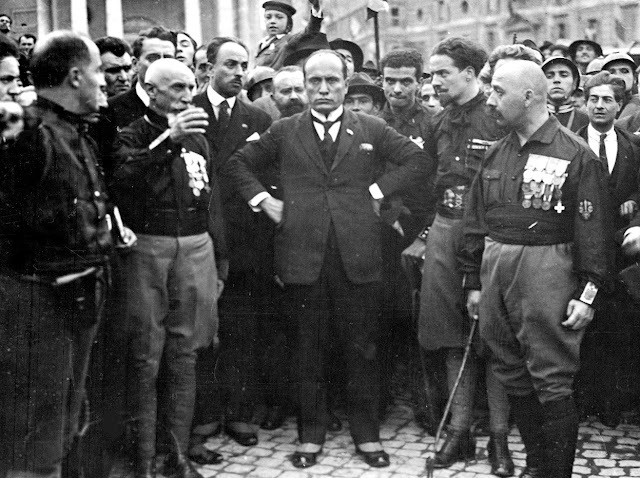 Nevertheless the direct reason for the fall of Mussolini was the hopelessness of resistance to Allied attacks. 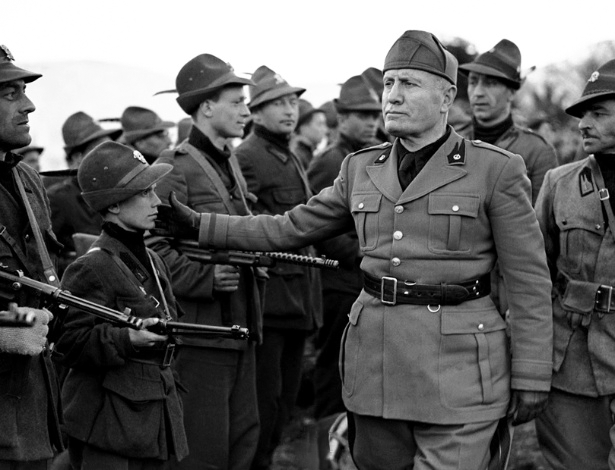 Despite Badoglio's great reputation there is no reason to think that the Italian troops will fight better for him than for Mussolini. The logic of the military situation thus dictates that the Italian Government make peace offers eventually—and there may even be a chance of an immediate snap offer to take effect before the Germans have time to react. Whatever the intentions of the new Italian Government, its formation was the first real challenge to the Roosevelt-Churchill doctrine of unconditional surrender. 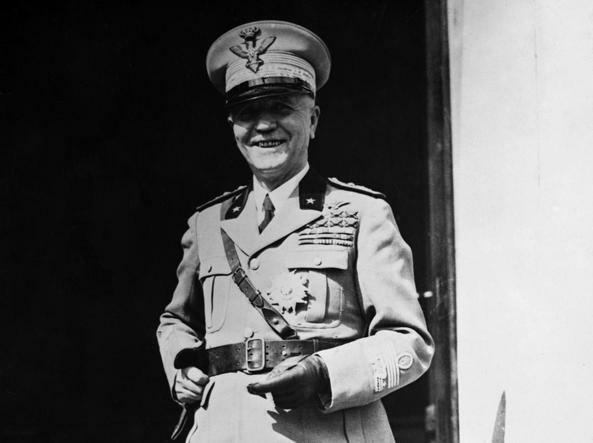 It posed the question of whether the Allies should treat with a King whom they have always considered to be deeply involved in Fascism—and whether that ruled out negotiating with Badoglio, a man noted for opposition to everything that Mussolini stood for. It was a fitting irony that the man who tried to make the people of a nation "live like lions" ended his career by simply quitting. But in a way that was how it started, too. The March on Rome in 1922 was made by Mussolini in a train when all possible danger had passed. And Victor Emmanuel, weak in chin and will, consented to appoint the former Socialist firebrand as Premier despite Marshal Badoglio's promise to drive the Fascists into the sea with two companies of troops. Once in power, Mussolini showed all the organizing ability and ruthlessness of a self-made big businessman—and also enjoyed the cynicism and brutality of a highwayman. The Italy he took over was rotten with war-born chaos, political decay, and rising Communism. He gave short shrift to politicians and sent Parliament packing in favor of a rubber-stamp National Assembly setting up his novel "corporate state" with its syndicates of workers and employers. For the first time, Europe witnessed the spectacle of a modern one-man dictatorship running a country with the efficiency of a big department store. Trains got in on time, factories buzzed, strikes were abolished. It was a regime of dynamism if not tolerance—yet Mussolini cagily stayed on good terms with King and church and had no truck with the racialism and anti-Semitism that was already being touted by another aspirant to Dictatorship across the Alps. The Duce then was as independent and hard-handed in his foreign as in his home policy. In 1933, he quickly recognized the danger in the Nazi movement and the following year balked at a Hitler coup in Austria by massing troops in the Brenner Pass. But, by that time, Mussolini had already begun to dream up new empires of his own. In 1935 he contemptuously bucked Britain and the entire League of Nations when he invaded Ethiopia. When sanctions failed and the League all but died, Mussolini made the most fateful decision of his lifetime. Out of vindictiveness against Britain and a mistaken estimate of German power, he joined with Hitler in evil alliance. The first Axis step was the joint intervention in Spain. The next and fatal move was the acquiescence to Hitler's annexation of Austria. Then came the era of Axis enthrallment of Europe by means of threats and boasts. Mussolini was riding high, wide, and handsome. On the Eternal City's walls he plastered maps showing the ancient Roman empire. In the National Assembly, his stooges baited France with cries of "Tunis! Corsica! Nice!" He boasted of "8,000,000 bayonets" and a mighty Fascist fleet. And in 1939 he launched the cynical Good Friday invasion that trampled little Albania. But if Mussolini fooled his enemies for a time, he also fooled his people and himself. For when the Fascist fighting machine was put to the test, it failed ignominiously. In campaign after campaign—in Greece, Egypt, Libya, Tunisia, and the Mediterranean—Mussolini's boasts blew up in the smoke of real battle. Time and again, Hitler had to send troops to the rescue. As the defeats increased, the would-be Caesar drew more and more into his shell. He seldom spoke and almost never made an appearance. But though growing bald and thinner with worry and age—he quit just four days before his 60th birthday—he still clung to his dreams and bluff, and even after the loss of his empire declared that the "last word" had not yet been spoken. It was all over last week, for this was the way the Duce's world ended—not with a bang but a whimper. Right after Marshal Pietro Badoglio resigned on Dec. 6, 1940, as chief of staff of an Italian army just routed by the Greeks, posters and stickers appeared on walls and windows all over Italy: "Italian people, stand fast! The King and Badoglio will be your deliverers." This week, the fate of Italy at last was in the hands of the deliverers. In his choice of Badoglio as Chief of Government, Premier, and Secretary of State, Victor Emmanuel got a seasoned campaigner—at 71 still erect, square-shouldered, and keen-eyed—whose professional soldiering had shown up brilliantly on the blazing desert sands of North Africa as well as the icy Alpine battlefields of the last war. Further, he got a man who two decades before might well have stamped out Fascism in its infancy. Ever a royalist professing allegiance to the House of Savoy, Badoglio—so the story goes—after watching the Fascist march into Rome in 1922 pleaded for a chance to rout them. He told the king: "Sire, with just two companies of Carabinieri I could sweep those Blackshirt upstarts into the sea." The man who on Sunday took the helm of the foundering Italian ship sprang from Piedmont soil which has been a battleground since Caesar's legions first marched into what was then Cis-Alpine Gaul. The military history of the farming country around Grazzano Monferrato near Milan interested young Pietro Badoglio much more than did his father's small farm there, and he was soon off to the Military Academy at Turin. Badoglio served in the Ethiopian campaign of 1896-97 and fifteen years later saw action in Libya. He was only a lieutenant colonel at the start of the last war, but his outstanding exploits—such as the capture of Mount Sabotino from the Austrians in 1916—made his rise meteoric: Six promotions soon elevated him to Assistant Chief of the General Staff. Mussolini shunted Badoglio off to Brazil as Ambassador in 1924. For almost two years he was out of the picture. Then he was recalled as Chief of the General Staff and created a marshal, Italy's highest military rank. In 1929 Mussolini again "exiled" him, this time sending him to Libya as Governor. Thus he was in the background when the Battle for Ethiopia began. But when that campaign bogged down, he was again called into action, and because of his victory over Haile Selassie he returned to Italy to receive a welcome unheard of since the days of the ancient Roman conquerors and the King created him Duke of Addis Ababa. Badoglio, in private life is a quiet, mild, steady-going man of culture and refinement, speaking several languages but ready and eager, on visits to his native village, to shed his coat and indulge in a game of Bocce with the local peasantry. Besides the Italian game of bowls—at which he excels—he is a skillful hand at the bridge table, and here he shows the same respect for detailed, methodical planning that he does on the battlefield. ¶ In New York Arturo Toscanini clasped his head in his hands and looked thankfully heavenward when he heard the news. ¶ In Pittsburgh Babe Pinelli, umpiring the Pittsburgh Pirates-Brooklyn Dodgers baseball game, waved his right arm to call Mussolini "out" when the news came in over the loudspeaker. More than 30,000 fans howled their approval. ¶ Radio Rome announced immediate discontinuation of its daily morning lesson in the German language. ¶ A Nazi radio commentator recited Badoglio's proclamation correctly except for one word. When he got to the part where Badoglio said he would "see to it that my orders are carried out scrupulously," the Nazi made it "unscrupulously." ¶ Malta bars ran out of drinks for those toasting the Duce's end; newspapers were sold out completely. 1944. Downs Arrives in the U.S. with the "Stalingrad Symphony"
A plane landing at New York on January 21 set down Mr. Bill Downs, CBS correspondent for 13 months in Moscow. Gripped in Mr. D's hand was The Paper, the paper being, of course, the first and authentic an true copy of Dmitri Shostakovich's Eighth Symphony, which CBS had obtained from Mr. S for a handsome package of rubles and its first performance in the Western Hemisphere. The Eighth is nicknamed for "the Attack music," as the Seventh was called "the Retreat music;" the Ninth, now going into production, is to be "the Victory music." Downs (though he is no kin to Olin Downes of the New York Times) believes that the piece will be highly controversial. So far neither Pravda, Izvestia, nor Red Star (the big three of Moscow papers) has reviewed its premiere, and the musicians over yonder are brawling about it pro and con. So the American people are cordially invited by CBS to wade into the controversy just as soon as (1) Am-Russ can have the necessary playing copies made here; (2) Dr. Artur Rodziński can size it up and (3) the New York Philharmonic-Symphony Orchestra can play it on the United States Rubber Company program some springtime Sunday afternoon. By that time it is CBS' devout hope that the indomitable Red Army and the undeniable British and Red-White-and-Blue armies will be reaching, reaching toward their final handclasp across a shrinking strip of the so-called Axis. Somehow that would make the music even better. Bill Downs, Moscow correspondent for Newsweek and CBS, wirelessed this account of developments in the Soviet capital following the conference. The American Embassy is getting that new-broom treatment extending from the lowliest clerk in the code room through the new military mission up to the Ambassador's office. The embassy staff had grown into a happy-go-lucky crowd, which more or less adopted a "nichevo" philosophy. The long time that Spaso House had been without an official hostess had turned the Ambassador's official residence into what was almost a super-luxurious fraternity house. The Mokhovaya House across the street from the Kremlin with embassy offices and apartments for military, naval, and Lend-Lease staffs was almost the same. No one had enough to do. Consequently the embassy military and naval staffs spent a lot of time chasing ballet and theater tickets. However, in the two weeks of the Moscow conference them days has gone forever. Ambassador W. Averell Harriman is already piling into the embassy organization. Desks, chairs, and whole offices have been moved. Kathleen Harriman, the American Ambassador's daughter, who will act as his official hostess, already has taken a college atmosphere out of Spaso. Maj. Gen. John Deane, new head of the military mission, has already got the parade ground back into his wing in Mokhovaya. This diplomatic spring cleaning in the American diplomatic military organization simply means that representatives are going to have more work to do, and they are clearing the decks for action. The new Ambassador held his first press conference in his office on Thursday. After expressing his gratification at the outcome of the talks, he said: "The conference opened up a number of subjects whereon it has been agreed that discussion should be continued between ourselves, the British, and the Soviet Union. This means I will be working closely on these matters with Molotoff and Sir Archibald Clark Kerr." Harriman revealed one significant fact which indicated how the conferees were thinking when he said: "One matter I think deserves the greatest possible consideration at this time is the assistance the United States can give to the Soviet Union in the rehabilitation of devastated areas and the repairing of other dislocations caused by war. Here again war must have first priority in our use of American productive capacity and available shipping, but there is one thing we can do now without interfering with war production. We can work on the development of programs, plans, and detailed designs which will materially shorten the time when equipment needed from the United States can be made available. The American people have the greatest sympathy for the Russian people, who have suffered so much, and it is in their hearts to attempt to be of the greatest assistance. We will have plants to produce machinery and equipment needed by the Soviet Union and in so doing we will help our own people to convert from war to peace production." 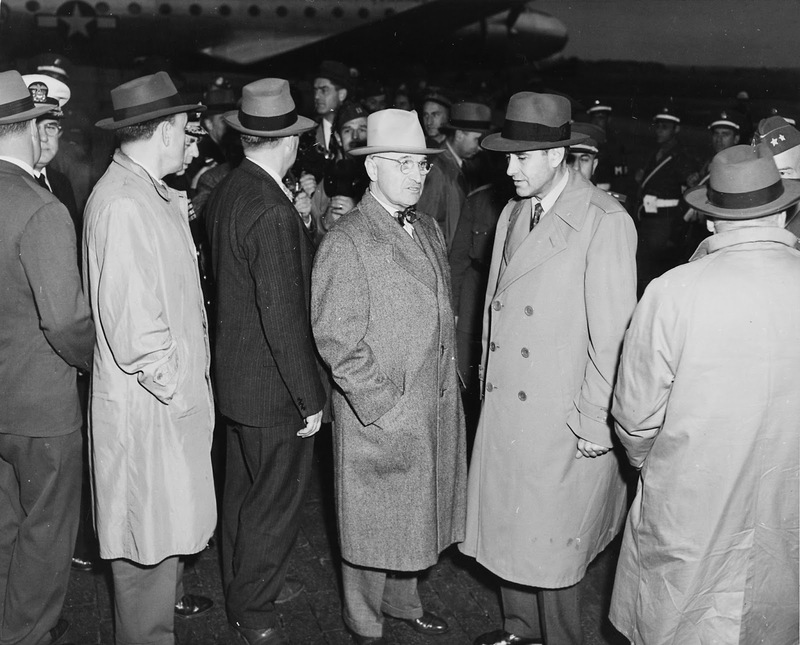 Harriman also announced that Charles E. Bohlen who accompanied Hull and was formerly assistant chief of the European division of the State Department would remain as first secretary. Bohlen served former Ambassador Steinhardt and is extremely well liked by the Russians. He has perfect command of the language and served as Hull's interpreter during the conference. For foreign correspondents the most important addition to the embassy staff which Harriman brought along is Sam Spewack, one of the nation's top playwrights now serving with the Office of War Information. Spewack, whom correspondents are already calling "Mister Secretary," has succeeded in starting a news-digest service for the embassy which was also made available to newsmen. He will investigate all fields of cultural exchange—news, photos, newsreels, feature films, the exchange of music, art, drama. He plans to set up an organization to match the excellent British cultural-relations section which publishes the only Russian-language weekly in the Soviet not owned or controlled by the government. 1943. Stalin Previews the Hollywood Film "Mission to Moscow"
Since its release early last month, Warner Brothers and Joseph E. Davies's "Mission to Moscow" has thrived on controversy (Newsweek, May 10). Vociferously attacked on the one side as a whitewash of the Soviet regime, and just as staunchly defended on the other as a worthy tribute to a gallant ally, the film has currently split Hollywood leaders into two sharply divided camps on the advisability of making films with political implications. The following dispatch from Bill Downs, Newsweek correspondent in Moscow, survived a three-day delay at the censor's desk to add an international huff and a puff to the storm in a samovar. The Russian premier of "Mission" was staged at the Kremlin, following a banquet for an international audience of diplomatic elect. Flanked on one side by a translator, and on the other by a beaming Joe Davies (then on his return engagement as missionary to Moscow), Stalin sat poker-faced throughout the two-hour tribute to his people and regime. The next night the print was loaned to the United States Embassy and run off for the staff and a group of newspaper correspondents. In each case the audience reaction is best summed up in one word—squirm. And alternating with the squirming was the self-conscious tittering of those who had to sit in the Presence while an onscreen Joe Davies held forth on the subject of Joe Davies. On occasion there were cinematic touches that provoked outright laughter. A bevy of Russian girls tricked out in ski-and-skating costumes looked just like what they were—Hollywood extras. Frieda Inescort, playing Madame Molotoff, attempted a spot of Russian dialogue that gave the Moscow natives a bad moment. And when the camera faded in on a Muscovite restaurant featuring the soulful strumming of a gypsy orchestra, several young army officers at the preview enthusiastically volunteered to withdraw on the off-chance of finding the place. Stalin's poker face may have derived from the fact that the film's portrayal of the Soviet Premier was judged the least adequate in a roster of generally excellent characterizations. 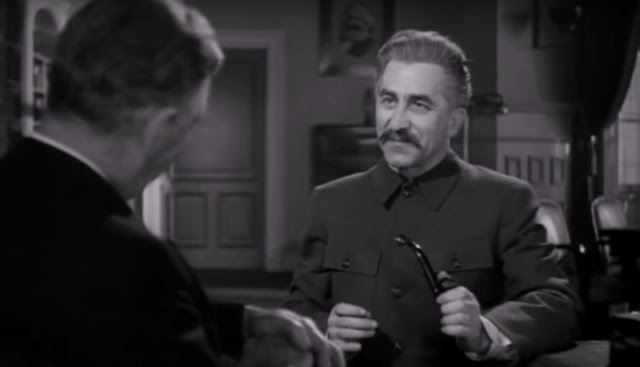 Playing Stalin for sweetness and light, Manart Kippen missed the strength and power and twinkling humor with which Stalin invariably impresses foreign visitors. There was less of the dead-pan among members of the British diplomatic legation, with some officials pointedly hinting that the film's unfriendly, inept, and undiplomatic conception of His Majesty's representatives to Russia was ill-advised. No one doubts that "Mission to Moscow" will be a sensational success in Russia, if only because the Soviets are anxious to see how they look to a foreign, though friendly, observer. At the same time, it was unanimously agreed that the Warner film was excellent propaganda for fostering better relations between the United States and the Soviet Union, although a number of changes are indicated if the film is to obviate a tendency of the realistic Russians to laugh out loud at the wrong places. William L. Shirer on "This I Believe"
William L. Shirer was one of the great pioneers of broadcast journalism. His work in print and on radio before and during World War II earned him wide renown. In 1940, he delivered an eyewitness report on Adolf Hitler's arrival at the Second Armistice at Compiègne Forest in France. EDWARD R. MURROW: This I Believe. The more a reporter sees, the more he learns about life and about himself. William L. Shirer has seen a great lot of what has happened to the world and to the people in it in our time. His Berlin Diary was one of the first documents to impress on us the enormity of the plague inflicted on civilization by a man named Hitler. Bill Shirer is a distinguished foreign correspondent, author, and lecturer, but he has another side: a simple homespun side springing from a boyhood in Illinois and college days in Iowa. This is the background against which he states his convictions. WILLIAM L. SHIRER: It's rather difficult in these noisy, confusing, nerve-wracking days to achieve the peace of mind in which to pause for a moment to reflect on what you do believe in. Though it is a thing we live by, and without it, without beliefs, human existence today would hardly be bearable. In my own case, there were two experiences in particular which helped to shape my beliefs: years of life and work under a totalitarian regime, and a glimpse of war. There's so little time and opportunity to give it much thought—though it is the thing we live by; and without it, without beliefs, human existence today would hardly be bearable. My own view of life, like everyone else's, is conditioned by personal experience. In my own case, there were two experiences, in particular, which helped to shape my beliefs: years of life and work under a totalitarian regime, and a glimpse of war. Living in a totalitarian land taught me to value highly—and rather fiercely—the very things the dictators denied: tolerance, respect for others, and above all, the freedom of the human spirit. A glimpse of war filled me with wonder not only at man's courage and capacity for self-sacrifice, but at his stubborn, marvelous will to persevere, to endure, to prevail amidst the most incredible savagery and suffering. When you saw people—civilians—who were bombed out, or worse, who had been hounded in the concentration camps or worked to a frazzle in the slave-labor gangs—when you saw them come out of those ordeals of horror and torture still intact as human beings with a will to go on, with a faith still in themselves, in their fellow man, and in God, you realized that man was indestructible. You appreciated, too, that despite the corruption and cruelty of life, man somehow managed to retain great virtues: love, honor, courage, self-sacrifice, compassion. It filled you with a certain pride just to be a member of the human race. It renewed your belief in your fellow men. Of course, there are many days in this age of anxiety when a human being feels awfully low and rather discouraged. I myself find consolation at such moments by two means: trying to develop a sense of history, and renewing the quest for an inner life. I go back, for example, to reading Plutarch. He reminds you that even in the golden days of Greece and Rome, from which so much that is splendid in our own civilization derives, there was a great deal of what we find so loathsome in our life today: war, strife, corruption, treason, double-crossing, intolerance, tyranny, rabble-rousing. Reading history thus gives you perspective. It enables you to see your troubles relatively. You don't take them so seriously then. Finally, I find that most true happiness comes from one's inner life; from the disposition of the mind and soul. Admittedly, a good inner life is difficult to achieve, especially in these trying times. It takes reflection and contemplation; self-discipline. One must be honest with oneself, and that's not easy. You have to have patience and understanding. And when you can, seek God. But the reward of having an inner life, which no outside storm or evil turn of fortune can touch is, it seems to me, a very great one. MURROW: That was William L. Shirer, father of two children, Connecticut farmer, and a reporter recently turned novelist, but most of all a citizen of integrity who believes that even in these anxious times, men will not only survive but progress if they don't break faith with themselves.